As a kid watching “20,000 Leagues Under The Sea,” Steven Saint Amour dreamed of adventures at the depths of the ocean. Now, the real-life explorer is living out his childhood fantasies, specializing in deep-sea search and recovery. For the past 32 years, he’s been unearthing sunken ships and aircrafts from impossible depths. Eclipse Group, Inc. (EGI) announces the acquisition of the R/V New Horizon, a 170’ U.S. Flagged research vessel. The vessel has been renamed the Bold Horizon to reflect EGI’s corporate vision. The Bold Horizonis home ported at the 10th Avenue Marine Terminal located in San Diego, California. Features of the Bold Horizoninclude a large, open main deck with a standardized 2’x2’ Baxter Bolt pattern, an articulated stern A-frame with 11,500-pound safe working load, J-frame, deck crane, CTD, instrumentation and 10,000-meter sidescan winches. The working deck has direct access to a “wet” ocean lab, “dry” lab facilities and a 15-person conference room with teleconferencing capability, office and other accommodations. 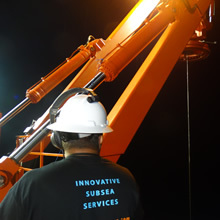 EGI’s 2,000-meter ROV Super Mohawk 15 has been installed and is operational at the time of this press release. EGI is planning to install a 4,500-meter rated Bluefin AUV to further enhance the vessel’s onboard capabilities.